Print Screen. Do awesome screenshots with My Print Screen Software. My Print Screen is free software for image capture. simply by pressing the button Prt Scr. MyPrintScreen is free image capturing software. Using MyPrintScreen you can take high-quality screenshots by pressing the Prt Scr button. Integration with Windows OS allows to simplify the screenshot making process which greatly saves your time. What OS does MyPrintScreen work with? Microsoft Windows® 8 (32-bit and 64-bit). How much does it cost to use MyPrintScreen? Does the program contain viruses and spyware files? MyPrintScreen was tested by the best antivirus systems for potentially unwanted applications and is considered one of the safest programs of its kind. The utility doesn’t contain viruses and spyware that can harm or add difficulties to your PC operation. Are there any special system requirements to install MyPrintScreen? MyPrintScreen has minimal system requirements, since the program doesn’t need many computer resources. Do I need to install an image editor to use MyPrintScreen? No, you don’t, because this software allows you to save images the next moment you have taken a screenshot. How to download MyPrintScreen on my computer? First of all you need to download the program installation file that can be found on the MyPrintScreen official web-page. Open http://myprintscreen.com/ in any web-browser and click Download. The downloading process starts automatically. How to install MyPrintScreen on my computer? 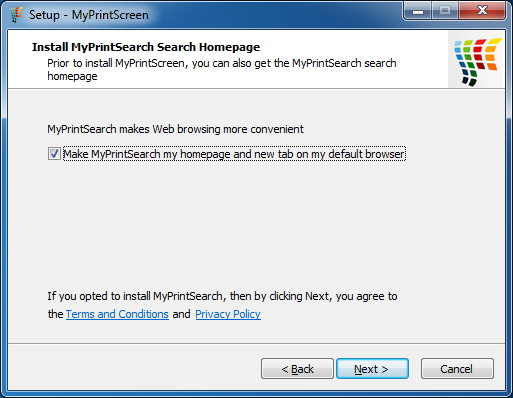 As soon as you have downloaded the MyPrintScreen installation file, you can proceed with the program installation. 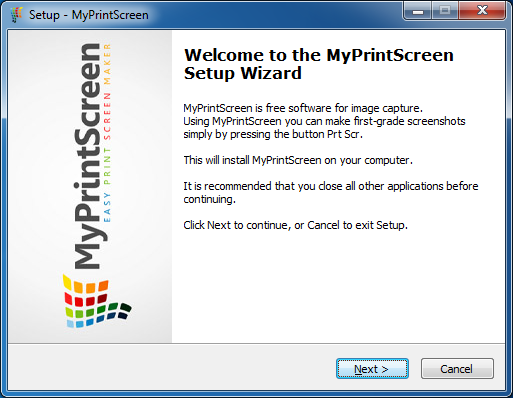 Now you can see the Setup Wizard of MyPrintScreen, click Next to continue the program installation. Peruse Terms and Conditions and License Agreement. If you agree with all the items, click the button Next to continue the installation. These options allow you to quickly run MyPrintScreen anytime you need it. As you have selected the corresponding items, click Next. Note! You should close other applications before running the installation process. The MyPrintScreen installation process is running now. Please, don’t perform any tasks until the installation is finished. When the installation is done, the program will run automatically and you can start taking screenshots. Does MyPrintScreen support hot keys? Yes, thanks to Windows OS integration MyPrintScreen supports the Prt Scr keyboard button. How do I know the program is running on my PC? When MyPrintScreen is active, you will see the program icon on your desktop. The program icon is also displayed in the tray. How to perform a screen capture? Click the MyPrintScreen desktop button. Point the cursor to the MyPrintScreen icon in the tray and right-click it. Select Make screenshot in the shortcut menu. Left-click the program icon in the tray to capture the screen. Press the Prt Scr keyboard button to take a new screenshot. How to save the ready image? Select the necessary area to capture. You should use the button Save image to computer that is on the program control panel to save the necessary image. You can also use the shortcut menu: right-click any part of the screen and select Save image to computer in the menu. How to take a screenshot of a certain screen area? The program automatically offers you to select the desired screen area. Use your mouse cursor to select the screen area then choose the necessary task. What do the figures in the top left corner mean? As you select a certain screen area you will see the pixel dimensions of this area at the top left corner of the MyPrintScreen window. Therefor you can control the size of the screenshot you take. What format can I save my screenshot in? MyPrintScreen works with the most popular image compression formats: JPEG, BMP, PNG. Can I get the web-link to the ready image? You can share links to your images with friends and colleagues by uploading screenshots to the MyPrintScreen server. 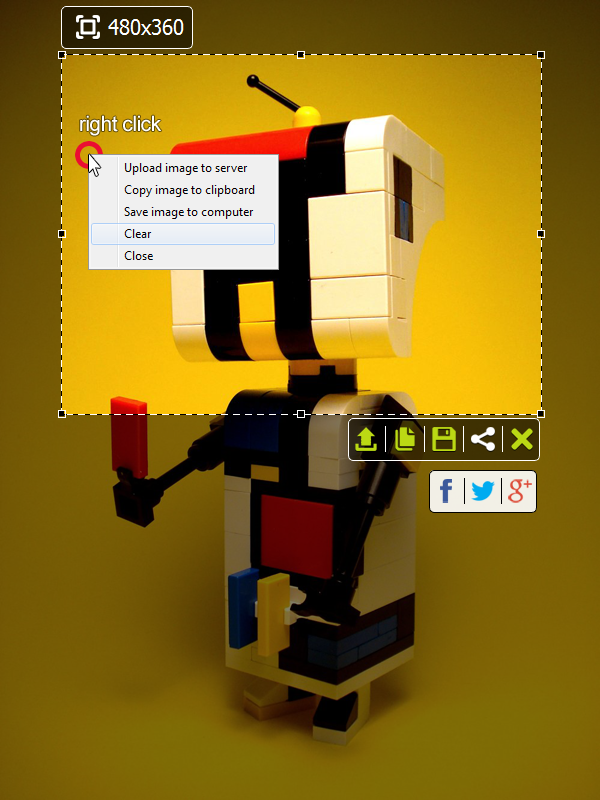 It’s easy as ABC: just click the Upload image to server button located in the program control panel. Mind that you can see the control panel when taking your screenshot. As you click the Upload image to server button, the link to the ready image will be copied to the clipboard and you can share it in every way. 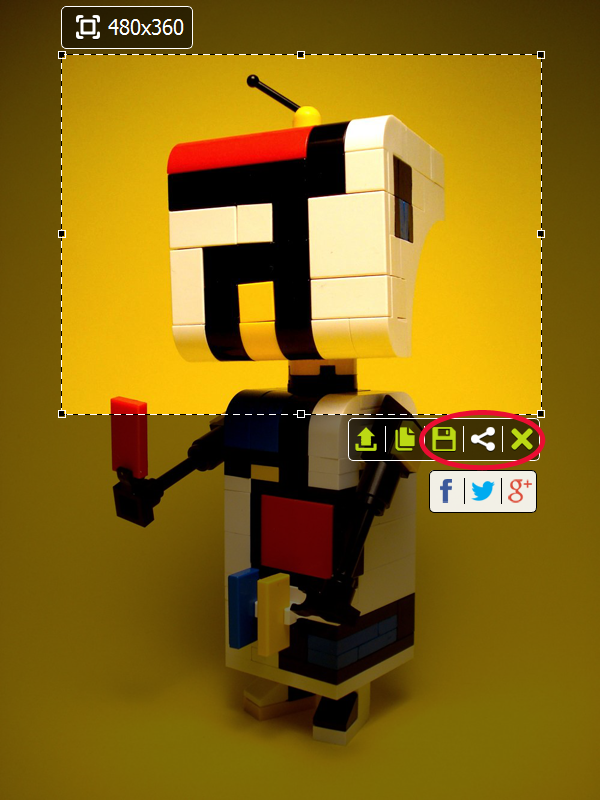 You can also use the shortcut menu: right-click any part of the screen and select Upload image to server. How to save an image to the clipboard? In order to quickly save an image to the clipboard, use the button Copy image to clipboard in the program control panel. You can also use the shortcut menu: right-click any part of the screen and select Copy image to clipboard. Can I share images on social networks? How to change the borders of the selected screen area? Click any part of the screen with the right mouse button and select Clear in the shortcut menu. You can select the necessary screen area to capture from scratch. How to cancel screenshot selection and creation? If you changed your mind, just click the Close button marked with X image in the program control panel. You can also select the item Close in the shortcut menu. The program window will be automatically minimized to the tray. How to show/hide the MyPrintScreen button? If you want to Show or Hide the MyPrintScreen desktop button, use the item Show/Hide snap button in the program tray. You can also Show/Hide the MyPrintScreen desktop button by clicking the MyPrintScreen icon with the right mouse button. How to change the program interface language? In order to change the MyPrintScreen interface language, use the button Languages in the program tray. Where can I find the program FAQ? 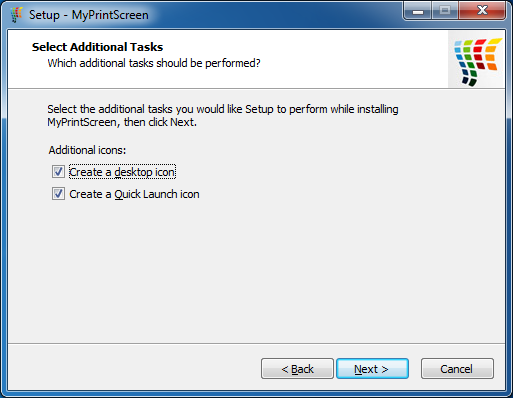 In order to read the MyPrintScreen FAQ use the button FAQ in the program tray. How to finish my work with MyPrintScreen? If you need to finish your work with the program right-click the MyPrintScreen icon in the tray and select Close in the shortcut menu. MyPrintScreen doesn’t require many computer resources, so it can remain active all the time. It doesn’t affect other programs operation. On the other hand you will always have the handy tool for quick screen capture at your fingertips.